Many of us will be hard boiling too many eggs this April. If you’re wondering what to do with the extras, here are a few celebrated ideas. And don’t boil every egg in the house. Keep a few in the fridge so you can whip up some of the other recipes below. 1. Place the room temperature eggs in a large saucepan. 2. 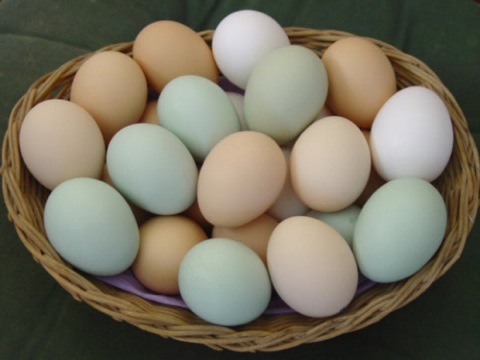 Cover the eggs with cool water by 1 inch. 3. Over medium heat, slowly bring the water to a boil. 4. When the water reaches a boil, cover and remove from heat. 5. Let eggs sit covered for 12 minutes. 6. To stop the cooking, transfer the eggs to a colander and run under cool water. 7. Tap shells on a hard surface, then peel under a stream of water. 8. 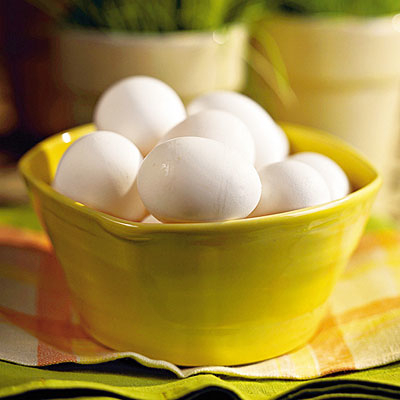 Remaining unpeeled eggs should be put in an airtight container and placed in a refrigerator. Store up to 3 days. 1. 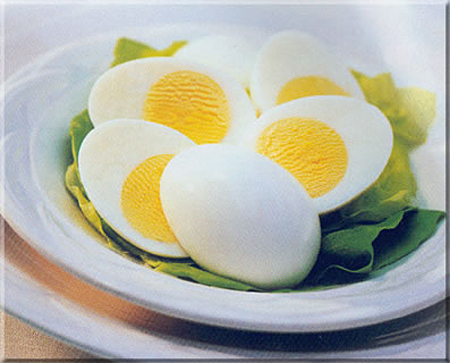 Peel eggs, then slice each egg in half. 2. Remove yolks, placing them in a small bowl. 3. Mash the egg yolks with a fork. 4. Stir in mayonnaise, pickle relish, and mustard. Season with salt & pepper. 5. Evenly fill egg whites with the yolk mixture. 6. Garnish with paprika, pickles and pimentos. Cover to store in refrigerator. 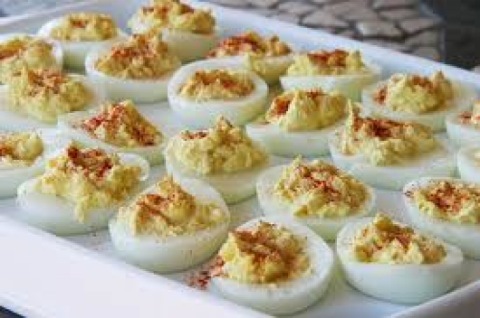 *Makes 14 deviled eggs. To make certain of having enough egg mixture, boil an extra egg as filler. 1. Hard boil the eggs. 2. 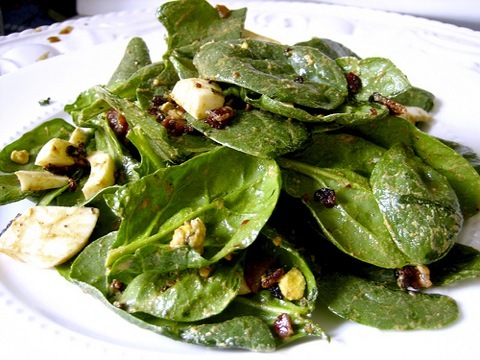 Tear salad leaves into small pieces. Place in serving bowl. 3. Heat garlic infused oil in small frying pan over medium heat. Add bacon and cook until crisp. 4. To drain bacon, lay pieces on paper towel. 5. Add Dijon mustard to the pan’s bacon juices. Whisk to combine. 6. Add cider vinegar and a dash of Worcestershire sauce. Whisk again. 7. Pour dressing mixture over the salad leaves. Toss. 8. Add bacon and toss again. 9. Quarter the eggs and add them to the salad. Add chopped parsley and gently toss. 1. Heat 2 teaspoons olive oil in small heavy skillet over medium heat. 2. Crack egg into the hot pan, sprinkle with salt and pepper. 3. Cover and cook until the yolk is almost set and egg is firm, about 4 minutes. 4. While egg cooks, toast bread until golden brown. 5. Brush bread with remaining tsp. of oil. 6. Rub the toasted bread with peeled garlic clove; sprinkle with Parmesan cheese. 7. 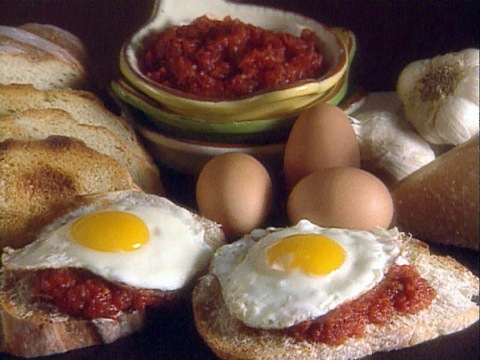 Spoon Marinara sauce over the toast, and top with fried egg. 1. Spread cream cheese on 2 bread slices. 2. Top one bread slice with fresh strawberries, then place the other slice on top of this. 3. Beat eggs and milk together in a bowl. 4. Heat skillet, then spray with Pam. 5. 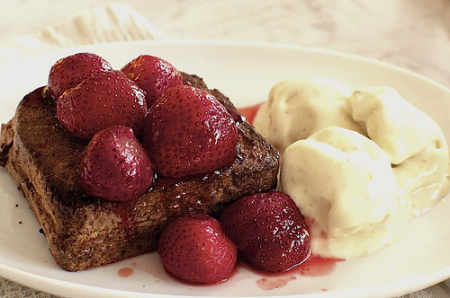 Dip the strawberry and crème sandwich in the egg batter. 6. Brown the sandwich on both sides in the skillet. 7. Place on serving dish. Sprinkle with powdered sugar. Recipe courtesy of the innkeepers at Flagstaff, Arizona’s Fall Inn to Nature bed and breakfast. Ovenproof baking dishes or ramekins. 3. Into each dish, break one or two eggs. 5. Spoon 1 tbsp milk (whole, skim or low-fat) or cream over the eggs. 6. Bake in preheated oven 12-14 minutes. Check eggs after 10 minutes. 7. Egg whites should be completely set; yolks should start to thicken, but not harden. 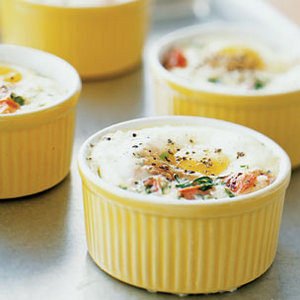 Eggs can be topped with items before baking. Some topping examples: shredded cheese, salsa, minced fresh herbs, chopped bacon or ham, light cream.